Back in the land of work and academia, life is trundling slowly on as we gear up for the new term. For me, that has mostly meant reading a lot of email, catching up on technical blogs and news aggregators and sadly neglecting all things crafty. Not that I've stopped thinking about doing crafty things of course, but for the moment I'm giving myself a stern dose of realism as to how much I'm actually going to get done in the next few months. At the moment, this is translating into refusing to allow myself to start any more projects until I get a few of my existing ones done. My intention was to have two projects on the go. One lace and one other, with the second being more portable and requiring less concentration. Hence why I had the cotton bag and lace projects from the list above. Then of course I bought a book on beaded crochet which meant I had to have a go at something similar. Jury service meant I had to have a project to take with me, so along came the baby blanket. And camping meant I needed a small project to take with me, socks being the obvious choice. This is the way that multiple projects start to pile up! I am trying to get through some of these and last night, I took the crochet motif bag with me to the pub for the Coventry Knit-Wits meet up. 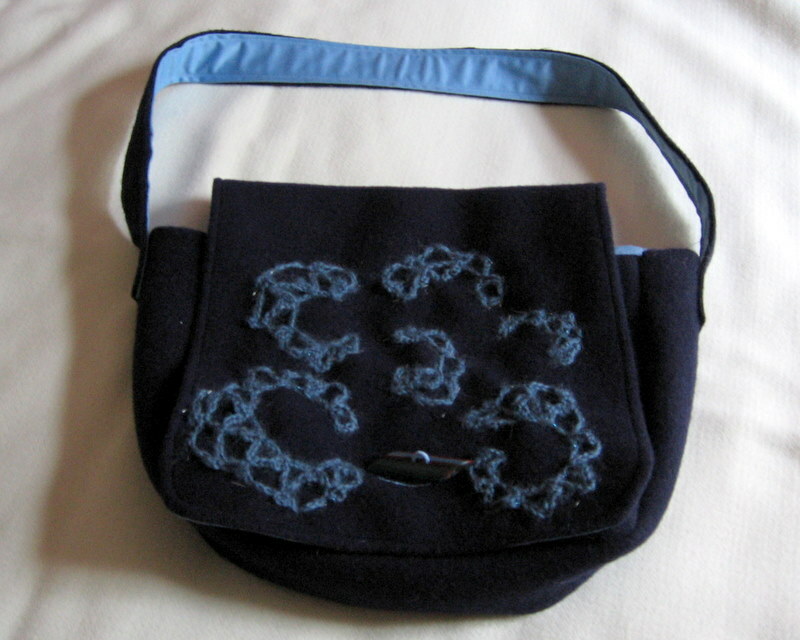 The bag itself was made up over a month ago now and I've been working on the embellishment side of things. I'll write more when I've finished, but I decided to have a go at attaching crochet beaded motifs and here they are pinned and ready to be sewn on. The motifs are not the easiest or quickest things to sew into place, their placement, shape and the number pins making it a slow job but after a couple of hours last night I am making progress. Soon hopefully I can list this one as finished. So some small progress there. And this morning I survived a near disaster involving a large, oversized kitten who shall remain nameless and 2mm bamboo circular needles. It is indeed fortunate that I have eyes in the back of my head!